There has been an awakening in the force. Only it's not at LucasFilm. This time it's at Marvel. After what is being described as years of frustration, Marvel Studios boss Kevin Feige is finally being freed from the Emperor like vice-grip of penny-pinching Marvel Entertainment CEO Isaac "Ike" Perlmutter, who is clearly being made to look like an old school villain in the press. Marvel Studios will now report directly to Disney chief Alan Horn in a company wide shake-up that promises to bring big changes to the MCU. But is it for the better? Kevin Feige is himself responsible for pulling off this reorganization of the film company side of Marvel. Kevin Feige is credited as being the architect who transitioned Marvel from a failing comic book giant into a movie powerhouse, which sold to Disney for $4 billion in 2009. He is said to have expressed his displeasure with working under Ike Perlmutter to Alan Horn and Disney CEO Bob Iger this past summer, but the reorganization was only put into effect last week. A Disney spokesperson had this to say to THR. "Marvel Studios is taking the next logical step in its integration with The Walt Disney Studios, joining Pixar and Lucasfilm in centralizing many of its film-related functions in Burbank, with Marvel Studios president Kevin Feige and co-president Louis D'Esposito continuing to lead the Marvel Studios team reporting to Walt Disney Studios Chairman Alan Horn." Ike Perlmutter is definitely feeling the blow from this power shift. The New York-based CEO is notorious for keeping a low profile. He has a bad reputation for being beyond frugal, and he has a tendency to keep secrets from people who should be in the know. Reports claim that he attended the 2008 Iron Man premiere in disguise to keep from being detected. And he notoriously complained about journalists at a junket drinking two sodas instead of the designated one soda. It has even been reported in the past that Chris Evans had to pay for his own gym time while prepping for Marvel's The Avengers. While Kevin Feige is finally breaking free from Ike Perlmutter, head of Marvel Television Jeph Loeb will continue to report to the Marvel Entertainment CEO. He will continue to oversee Marvel's TV series, publishing, animation and other New York-based operations. This means there will be a bigger divide between shows like Marvel's Agent Carter and Marvel's Agents of S.H.I.E.L.D. and their MCU counterparts. Ike Perlmutter, who is 72 years-old, is believed to have accepted Kevin Feige's proposal to have Marvel Studios break free from Marvel, which just goes to show how much power Feige has amassed over the years. 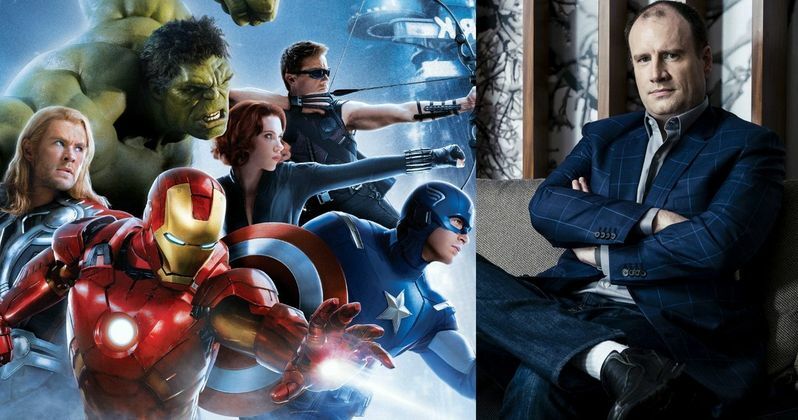 He has overseen the movie slate since 2009, which is responsible for earning more than $7 billion for Marvel and Disney. The studios currently have superhero movies planned all the way through 2019. The first movie, in what is known as Marvel Phase 3, Captain America: Civil War, has already wrapped production, with the second movie, Doctor Strange, getting ready to shoot this fall. This power shake-up will be most taxing for Disney CEO Bob Iger, who must now manage several freestanding brands all under the Disney banner, including LucasFilm, Pixar and Marvel, all key acquisitions that have brought Disney valuable property assists and creative expertise. The saving grace is that each of these splinter companies are served by powerful executives who all have tremendous insight and power over their own little corner of the ever-expanding Disney universe. Kevin Feige has long been considered the key figurehead at Marvel, since he first produced 2008's Iron Man, all the way through the work he did in shepherding this summer's blockbuster hits Avengers: Age of Ultron and Ant-Man. Says one source close to the company, who feels Kevin Feige has earned the right to break free. "Everybody knows Ike is difficult. This has been a long time coming. Kevin has grown his entire career under Ike and now it just makes sense." This move certainly means big changes for the way Marvel Studios is run. Some see it as a chance for the MCU to expand beyond the constricted shoebox Ike Perlmutter liked to keep it in. Though some feel it could be a dangerous move. Up until now, Marvel has had nothing but success after success, with all of their movies hitting #1 at the box office on opening weekend. If the movies start to falter, Kevin Feige will be the only one to blame now. But inside sources don't think there will be a problem. This is seen as nothing but good for Disney and Marvel Studios. What do you make of this inside baseball business? Do you think a power shift will mean better or worse product in the future? We definitely won't be able to tell just from Captain America: Civil War. That sequel sells itself, and is already positioned to be one of the biggest movies of all time. And it wrapped before this news was finalized. Perhaps we'll get a better understanding of Marvel's future when we finally see Doctor Strange in the second half of 2016.